DELWP fire officers had two info sessions in this region last month to brief residents about the upcoming fire season, and planned burning operations. To see where these burns are taking place on the Department of Environment’s interactive map, click here. It’s not the friendliest map, but a bit of persistence will give you a detailed look at where burns are planned for the next three years. 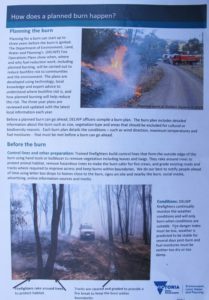 sheet is a bit idealised: FOBIF has had experience with burns which don’t look quite as smoothly planned and implemented as the scenario on the sheet. In particular, the statement that firefighters ‘rake around trees to protect animal habitat’ will ring rather hollow to readers of this website, familiar with the apparently relentless destruction of habitat trees in Department operations.